Much of the attraction I feel for my woody friends is based on the great diversity among the many members of the forest family. Just as we see variety in any human community, we observe all the individuals that exist together to make up the whole of the forest community and find a wide range of sizes, shapes, forms, and personalities. From the small and graceful forms of the Japanese maples to the exotic and unusually leafed gingko bilobas to the stoic symmetry of the white pines—differences abound in gracious plentitude. Now we come to a magnificent yet humble giant—the Eastern Cottonwood tree (Populus deltoides). 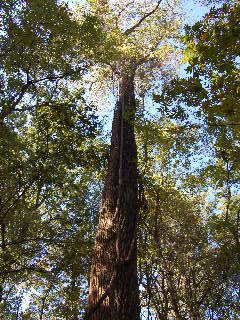 Standing tall on the forest floor, this skyscraper of a timber maker requires a whole new set of adjectives. Don’t even get me started! Well, okay, if you insist—how about mammoth, awe-inspiring, jaw-dropping, grand, enormous, gargantuan, immense, colossal, or huge? How about if we just say the Eastern Cottonwood is really a pretty big tree or that it’s really a big tree that’s pretty? 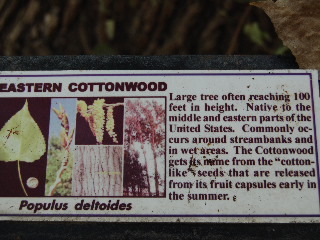 The photographs on this page of the big cottonwood tree and its accompanying identification plaque were taken along the nature trail at the Tunica RiverPark. The Eastern Cottonwood tree is native to much of the eastern part of the United States (and parts west of the Mississippi River) from north to south and is found in all but the hottest and coldest climates. It prefers full sun on moist sites, where it will grow quickly—reaching magnificent heights sometimes exceeding 100 feet. The mature seeds of the cottonwood tree are attached to small fluffy tufts of cotton-like hairs that are blown and scattered by the wind, making the process of seed dispersion look like a gentle snow blowing across the forest. This accounts for part of the descriptive use of the word “cotton” in the naming of this tree. And to a lesser extent in the name-calling process, the wood of this tree is also rather soft (though not cottony-so), especially considering that the Eastern Cottonwood is a deciduous hardwood tree whose wood is sometimes used in making veneer and for paper production. If you can find one at your garden center or nursery, the Eastern Cottonwood tree can be planted into your home landscape for the purpose of establishing a magnificent shade tree. It should go without saying (though I’ll say it anyway), if you plan to plant a cottonwood tree near your home, make sure it has lots of room to spread upward and outward. If you don’t get to plant one, I hope you get to visit one in its natural environment sometime, just to be inspired by the magnificent grandeur of the Eastern Cottonwood tree!